Gold with earthy brown, dark red and grey tones. 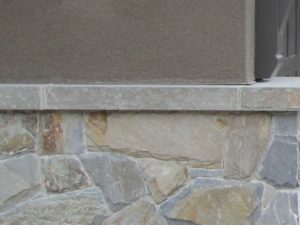 Natural stone veneer products are available in a vast range of profiles, styles and colors. They can be applied to almost any architectural style home to add beauty, value and visual pleasure to architectural elements. Quarried in Montana, our Autumn Gold Ledge Stone Veneer features traditional ledge stone cuts with the distinctive Chief Cliff colors and textures. A mix of rectangular and square shaped stones, this product is available in 2" to 8" face heights and 3" to 18" lengths. Its most striking feature is the gorgeous natural color palette that mixes gold with earthy brown, dark red and grey tones. 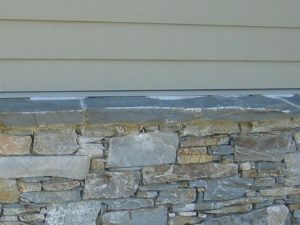 Autumn Gold Ledge Stone Veneer is a spectacular option for home exteriors, to improve your curbside appeal. Use it to add character and warmth to modern and contemporary architectural styles, and to add elegance and character to traditional, Mid-Century Modern or Craftsman style homes. The organic stone texture blends seamlessly when incorporated with wood, metal or glass finishing materials. Applying this product to half walls, columns, retaining walls and porticoes around the front door can accentuate existing architectural elements while creating a harmonious front elevation. Elsewhere on your property, natural stone can add significant style and an organic look to any landscaping project. Use it to create outdoor rooms and kitchens, on outdoor walls, gate posts and retaining walls around pools, fireplaces and garden elements. Indoors, using natural stone strategically can create a sense of drama and luxury in family and living rooms. It works especially well as a fireplace surround, extended floor to ceiling to emphasize height and give more power and direction to the space. It also looks great as a feature wall in transitional spaces such as front foyers, hallways, stairwells and landings. It can also be used in kitchens to add a rustic touch to an island or pizza oven. One could also use it as a finish in the bathroom to create a special spa-like ambiance. Natural stone veneer products offer great value and lifetime durability. That's why materials like Autumn Gold Ledge Stone Veneer are a hit with builders, Interior Designers, Landscape Architects and DIY home renovators alike.